** A version of this article was published on Muftah. The hostage crisis in Algeria is a violent reminder of the rapidly deteriorating security situation in the North Africa and the Sahel regions. On January 16th, 32 armed militants stormed the In Amenas gas complex in southeast Algeria, holding several hundred hostages in the process. After four days of siege, and an early attack by the Algerian forces on the terrorists who tried to move the hostages, the Algerian army launched a final assault on the core gas facility where the terrorists were holding most of the hostages, and reportedly engaged in a collective assassination of the hostages. There is scant information about that assault and what transpired in the early morning hours of Saturday, January 20th. What we now know through Algerian officials is at least 38 civilians had been killed during the course of the four-day siege, and 29 militants. Nearly 700 Algerians and 100 other foreigners survived, while five people are still missing. The incident has increased interest in the region and led to exaggerated fears about the threat of al-Qaeda and militant Islamism in North Africa. Nevertheless, the increase in militant activity in the Sahara is cause for concern. While the various extremist groups are divided, their impact in the region and northern Mali can no longer be ignored. Ever since the end of the Algerian civil war, various armed, Islamist splinter groups retreated to the vast stretch of the Sahara desert where they marauded smuggled, and occasionally kidnapped foreigners for ransom. For a time, these groups acted more like criminal gangs operating in the lawless territories north of the Sahel, than well-structured paramilitary groups. However, with the so called “Arab Spring,” and the toppling of Muammar Ghaddafi’s dictatorial regime in Libya, various fighters from the nomadic Touareg tribe retreated back to their original homelands in the Sahel, which were now inhabited by the Islamists. Having previously worked for the Libyan government, the Touareg fighters brought with them vast piles of weapons and military training. Longing for an autonomous state in the north of Mali, in less than a year, Toureg fighters, united under the banner of the National Movement for the Liberation of Azawad (MNLA), launched a secessionist war against Malian government troops. The fighters managed to push back most of the beleaguered Malian military to the capital city of Bamako. In March 2012, mounting pressure from the MNLA caused the military in Mali to oust president Amadou Toumani Toure. Since then, the MNLA, which had formed an alliance with the Islamist “Ansar ad-Din” (Defenders of the Faith), led by Touareg rebel leader Iyad agh Ghali, and al-Qaeda in the Islamic Maghreb (AQIM), have extended their control over most of northern Mali and its major cities of Gao, Kidal, and the mythical city of Timbuktu. Reportedly receiving material support from AQIM, “Ansar ad-Din” split from the MNLA, and have since extended de facto control over parts of northern Mali. 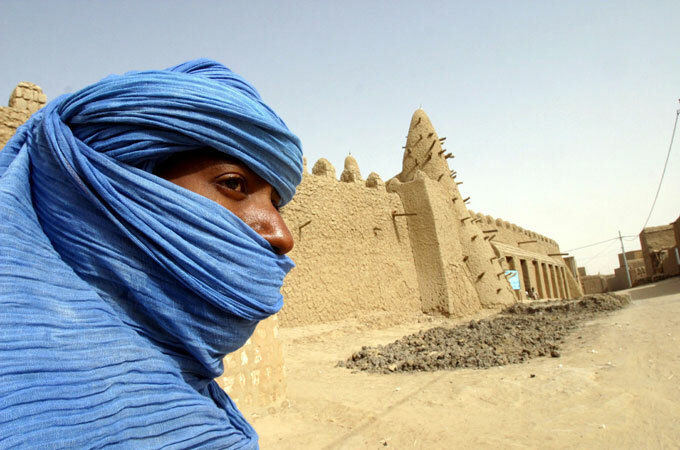 The “Ansar ad-Din” aims to impose fossilized interpretations of sharia law in Mali, and has instituted strict puritanical rule a la Taliban in the areas under its control in northern Mali, destroying a number of medieval Islamic shrines in Timbuktu. The incident at In Amenas gas complex in eastern Algeria has effectively internationalized the conflict in Mali, and has shed much needed light on the deteriorating security state in the Sahel region. Nevertheless, militant Islamists operating in the region are too fragmented, and small in numbers to represent a major threat to states north of the Sahel. Ansar ad-Din and AQIM are the most visible of all the militant Islamists operating in the Sahel region. Others include the Movement for Tawhid ( or “Unity”) and Jihad in West Africa (MUJAO), which has created a new brigade of 4 battalions named after former al-Qaeda leaders. MUJAO is led by Mohammed Ould Nouimer and is mainly active in the northern parts of the Sahel region. It has links to various other militant groups operating in Chad, Libya, southeast Algeria, Nigeria, and Niger. In addition to MUJAO, two other groups are actively marauding the region, “Ansar ash-Shari’a”, led by ‘Ammar Ould Hmaha, who was affiliated with MUJAO, and the recently-created “Signers-in-Blood” group, which has been implicated in the Algerian hostage crisis. Some have suggested that the latest surge in militant activities is tied to rivalry between the region’s more significant Islamist factions, including “Ansar ad-Din”, and MUJAO, and the “Signers-in-Blood” group. Moktar Belmokhtar, the one-eyed former “mujahid” who founded the “Signers-in-Blood” and fought against the Soviets in Afghanistan as well as in the Algerian civil war. has managed to elevate his status among militants operating in the region. Formerly responsible for the “al Mulathamin” (the Masked Ones) brigade inside AQIM, Belmokhtar created his own group after being sacked by AQIM’s leader, Abdel Malik Droukdal. Belmokhtar’s was reportedly sacked because of his use of strategies that were not seen as puritanically jihadist. It is, understandably, difficult to reconcile Belmokhtar’s reputation for cigarettes, drugs, and car smuggling with the esoteric Islamic practice of jihad. Having frequently split money from kidnapping ransoms and smuggling activities with local tribes, Belmokhtar earned the nickname of “Mr. Marlboro,” and carefully cultivated an image as a “Robin Hood” of the desert. All Islamist groups in the Sahel are loosely connected, and most of their leadership and fighters are former “Jihadis” from Afghanistan and Iraq, armed splinter groups from the civil war in Algeria, and local Touaregs formerly embedded in Ghaddafi’s corps of foreign fighters. These groups have all at one point been affiliated with AQIM, and share similar goals for establishing radical Islamic states in the region. Each group is also vying for regional supremacy, making periodic divisions between them a virtual certainty. For instance on January 24th a major Touraeg leader within “Ansar ad-Din” announced his split from the Islamist group. Touareg leader, Alghabass Ag Intalla, stated that his decision to leave the group represented an attempt to open negotiations with the government to settle the crisis in Mali. This latest rift comes amisst ongoing French strikes against Islamist rebels, and is due to fears of potential wider international retaliation in the aftermath of the Algerian hostage incident. It also reflects internal discussion within Ansar ad-Din about the movement’s future trajectory in the shadow of AQIM’s nefarious, and “foreign” Islamist plans for northern Mali. The international community has been timid in its response to events in northern Mali. France’s ongoing military strikes against the Islamist push toward Bamako were undertaken only after French geo-strategic interests were threatened. France is the largest importer of Malian uranium, which is key to the French nuclear industry. French companies have also invested heavily in uranium, minerals, and natural resources in neighboring Niger. The state-owned French energy company, Areva, has, for instance, invested more than $1.6 billion in Niger’s Imouraren uranium mine. The latest military action by France is, as such, more about securing its investments in Mali and Niger,. The United States has provided logistical aid to France and has helped transport some French troops into the region, while the British have pledged to play some supporting role short of putting actual troops on the ground. For a long time, North Africa was seen as a quiet region with little to no geo-strategic interest for the international community. The quagmire of Western Sahara, which has hindered any cooperation between Morocco and Algeria, has also prevented the creation of a regional security regime in the Maghreb and thwarted local coordination to rout out militant groups. With the current security situation in the Sahel, the only way forward is for all regional countries to make a concerted effort, with the help of the United States and the Europeans, to increase multilateral security arrangements and intelligence sharing that integrates North Africa, Sahel, and the Economic Community of West African States (ECOWAS). This will allow states in the region to better combat militant groups and return some semblance of stability to the Sahara. Hello, do you have a mail? I would like to ask you a question, which I would like not to turn up on google. Blogger of "The Middle Eastern Tales"